Tomy Splashy Penguin Bath Toy Splashy the Penguin is a singing, flapping bath toy from Tomy! 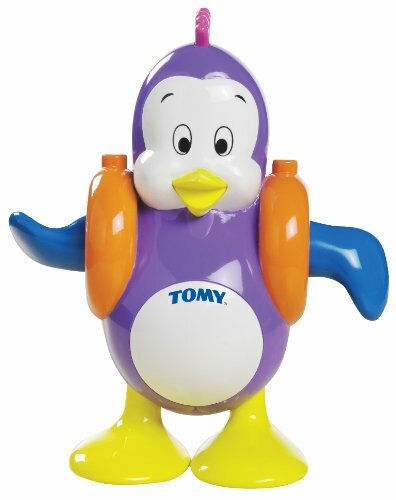 Getting kids into the bath can sometimes be a struggle, but with our Tomy Splashy Penguin Bath Toy you will have no problem! Wind up Splashy the Penguin to make his flippers flap and slide his rubbery mohawk forward to hear him sing! Lie our Tomy Splashy Penguin Bath Toy on his back in the water and hear him hum "Row Row Row Your Boat" as he flaps his arms and swims through the water. Lie Splashy the Penguin face down in the water and he will gargle the song as he swims! A fantastically fun Tomy bath toy full of laughs, music and a pretty swift mover albeit wearing arm bands.